Get 5 FREE guides and templates! If you're in HR, you need the right tools to do your job well. So we've prepared a kit just for you, ready-made to save you time and energy. Whether you're struggling with a job description or employee training, looking to rewrite your employee handbook, or trying to quickly calculate your cost-per-hire, these handy resources will help you stay ahead of the game in 2018. 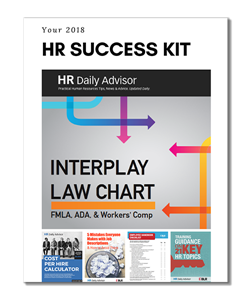 Along with this download, you will recieve a complimentary subscription to HR Daily Advisor, a daily e-newsletter of original and curated content.